Citing the fourth transformative development in the company’s 115-year-old existence, Bill Ford, executive chairman of Ford Motor Co. in Dearborn, today announced that the automaker’s renovation of the historic Michigan Central Depot and surrounding property in Detroit’s Corktown district would make it the global leader in mobility and innovation. 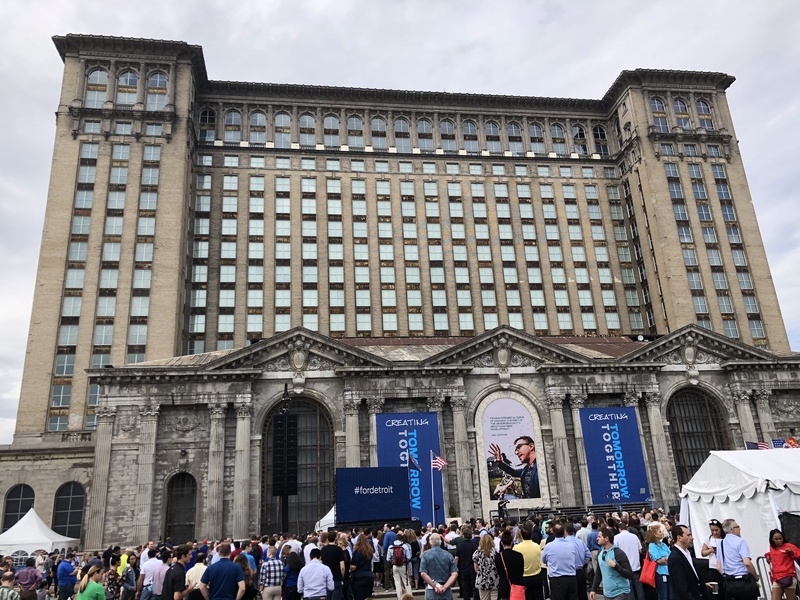 “In my almost 40 years at Ford, rarely have I been as excited as I am about this announcement today,” Ford told a crowd of some 5,000 people gathered in front of the train station, made up of employees, retirees, Ford family members, guests, media, civic leaders, and community members. “Michigan Central Station is a place that in many ways tells the story of Detroit over the past century. The new Corktown campus will be a hub where Ford and its partners will work on autonomous and electric vehicles, and design urban mobility services and solutions that includes smart, connected vehicles, roads, parking and public transit. The new Corktown campus will be a hub where Ford and its partners will work on autonomous and electric vehicles, and design urban mobility services and solutions that includes smart, connected vehicles, roads, parking, and public transit. The acquisition of Michigan Central Station comes alongside the company’s nearby purchase of the former Detroit Public Schools Book Depository, two acres of vacant land, the site of an old brass factory, and the recent purchase of a refurbished former hosiery in Corktown — dubbed The Factory at Michigan Avenue and Rosa Parks Blvd. (12th Street) — now home to some 220 Ford’s electric vehicle and autonomous vehicle business teams. Ford plans to have at least 1.2 million square feet of space in Corktown, three-quarters of which will be split between the company and its partners. Approximately 2,500 Ford employees, most from the mobility team, who will call Corktown their work home by 2022 — with space to accommodate 2,500 additional employees of partners and other businesses. The remaining 300,000 square feet will serve as a mix of community and retail space, and residential housing. Ford says the project is supported by the company’s strong partnership with state and local government officials. Development of Michigan Central Station and other Corktown locations is critical to Ford’s future as the company continues learning how urban areas are changing and the role transportation plays in revitalizing cities. Being in the heart of America’s comeback city will help attract talent, startups and engineers that want to address these issues with Ford. At the same time, Ford is continuing with its Dearborn Campus Transformation plan that started in 2016. This summer Wagner Place, a mixed-use development offering 150,000 square feet of space along Michigan Avenue in West Dearborn is on track to open, as is a new driving dynamics lab located on Ford’s Product Development Campus. The 10-year Dearborn plan will also continue to bring key work groups closer together, including the company’s product development teams to one campus. As cities cope with booming populations, aging infrastructure, and new technology, the way people move is changing rapidly. Rather than simply integrating new technology into an aging transportation system, Ford’s vision includes a fresh approach for how the overall transportation system can benefit from new ideas that help people lead better and more productive lives. The future of transportation requires more than new vehicles – or even self-driving vehicles. It requires smart vehicles that can communicate with an increasingly smart and connected world. That’s why Ford is developing what is calls a Transportation Mobility Cloud — an open platform that manages information flow and transactions between different services — to help cities optimize their various modes of transit. The company is also committed to ensuring vehicles can communicate with tech-enabled surroundings to reduce CO2, lower congestion, and improve safety. In Corktown, Ford’s efforts can come together in an urban environment, proving-out technology in the same environment where new ideas must be applied. The campus has the potential to help return Detroit to being the “mobility capital of the world” – shaping the future of transportation for the better. Ford’s plans for the station include restoration of the grand hall to its original luster; the attraction of local shops and restaurants open to the public; and creating new residential options in the up-and-coming neighborhood. More details will be released in the coming months. Built for the former Michigan Central Railroad, the depot replaced the original depot in downtown Detroit, which was shuttered after a major fire in December 1913 (though port facilities that were part of the original depot were still active for decades). Formally dedicated on Jan. 4, 1914, the new station remained open for business until the cessation of Amtrak service on Jan. 6, 1988. With a train depot and 13-story office tower with a roof height of 230 feet, it was the world’s tallest rail station when constructed. The depot marks the fourth transformative event in the company’s history, says Ford. Ford’s Highland Park plant helped create America’s middle class. At Willow Run, Ford workers built the planes and tanks that helped win World War II, setting the stage for American prosperity, while generations of families worked at the 100-year-old Rouge factory in Dearborn, putting the world on wheels and helping grow the middle class. Exhibit: Curated in partnership with the Detroit Historical Society, an open and airy exhibit allows guests to explore the rich history of Michigan Central Station and Detroit through visuals, text, and artifacts, while taking in the grand architecture around them. The exhibit includes pieces from local artists who capture the spirit of Corktown today. Self-guided tour: Visitors will have rare access to the entire first floor of the train station with a self-guided tour that showcases images of what the train station once was, juxtaposed with how it looks today. Documentary preview: Visitors will get a first-look at “Detroit: Comeback City,” a History Channel documentary that charts the mutual rise, fall, and rise again story of Detroit and Michigan Central Station in the words of real Detroiters. The documentary will debut at 9 p.m. eastern July 1. Community Area: Ford is hosting community engagements in partnership with the Ford Fund inside the station, highlighting local artists, entrepreneurs, and youth from Corktown. Activities include live mural making with Corktown artists and a student STEAM lab. Editor’s note: In the July/August issue of DBusiness magazine, read about how Ford’s Corktown campus and the region can benefit by setting up a 5G cellular network.